WestNet acquisition points the way, says Roy Morgan. AAPT customers may look forward to better times following the $60 million purchase of their provider by iiNet, ranked Australia's No.2 ISP for satisfaction in a Roy Morgan poll published on the day of the takeover bid. On Friday, the market researchers found that 89.9 percent of iiNet customers were satisfied with their provider, up 5.6 percentage points in six months, compared to just 72.9 percent of AAPT customers. The average in the poll, recorded across about 7000 respondents, was 72.6 percent. 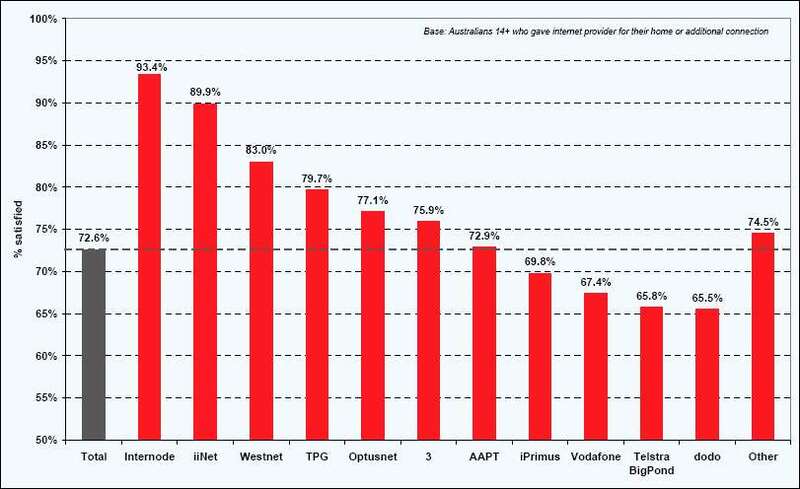 In September, iiNet will acquire AAPT's 113,000 DSL customers and 251,000 consumers with other services. And if the experience with iiNet's buy of WestNet is an indication, AAPT subscribers have reason to hope, the researcher said. Roy Morgan's gong for happiest surfers went to Internode, 93.4 percent of whom said they were satisfied with their ISP. And high download quotas soothed TPG's customers, 79.7 percent of whom said the provider did a good job. Dodo, where just 65.5 percent of users reported satisfaction, stole the wooden spoon from Telstra BigPond (65.8 percent). Roy Morgan mobiles and internet research director Andrew Braun said the flow on improvements in service to AAPT customers would depend on the grace with which iiNet integrates them into its business. "One would expect that AAPT customers will benefit from iiNet's service standards but this depends on how quickly and effectively iiNet is able to migrate its customer-facing systems such as its call centre operations and products to AAPT customers," Braun said. "Often this takes some time because acquisitions involve restructuring, staff retraining and IT system enhancements. "However, the satisfaction level of WestNet (bought by iiNet in May, 2008) is relatively high at 83 percent." He said top providers meshed well-priced technically innovative solutions with old-fashioned customer service. "The customers of Internode and iiNet are also more likely to consider that computers and technology give them more control over their lives and are comfortable giving their credit card details over the internet," he said.